So Coldplay – incredible. If you want a good description, read Lisa’s blog. I learned a lot about concerts in general. One thing is that you’re sort of expected to stand for the whole thing, which actually wasn’t as hard as I thought. Another thing is that people sing along, out loud, and some can’t sing. Another thing is that people smoke marijuana around you to the point that you feel like you’re smoking it, too. Mostly, Chris Martin and the band are geniuses. My favorite part was the song “Yellow”, when huge yellow balloons fell from the ceiling, and showered people with golden sparkles whenever someone popped one. It was magical. Or maybe it was just the marijuana. I have more interesting things to talk about. Possibly the best story since chili night. I’ll give you a hook, so you’ll keep reading. It involves calling 9-1-1, but there’s no deaths or serious injuries, so don’t worry. Ready for the story? Ok. It starts Saturday night. My roommates and I had just finished watching a movie, and we were getting ready for bed. Suddenly I smelled something really funky. I thought maybe it was a match, or maybe my marijuana-infested clothes from the previous night. But it just kept getting stronger. Soon my roommates were also complaining. I was glad it wasn’t just me. After sniffing around everywhere, we concluded it must have been a skunk outside. I felt satisfied with this conclusion, and went to bed. Fifteen minutes later, Danice burst into my room and said, “It’s gas. We have to get out of here.” I guess her and Bryanna had discovered online that propane can smell a lot like skunk, and after sniffing around more outside, they thought the smell was strongest coming from the vent to the upstairs part of the house. I quickly put my clothes on, thinking about whether I should take anything with me, like my guitar, or my wallet. I remembered from grade 1 that in a fire-related emergency, you’re not supposed to try to take anything with you. So, leaving everything behind, the three of us went outside, and across the street, fully expecting the house to ignite in flames. As we stood there staring at the house, Bryanna pulled out her cell phone and called 9-1-1. As we waited for the emergency personnel, we discussed the fact that she wasn’t wearing any underwear, despite her mom’s warnings that she should always have a clean pair on in case she died. Soon we saw the fire truck coming down the road. They pulled around the corner and just sort of stopped in the middle of the street. Wow, I thought to myself, this is so serious that they’re not even going to take the time to park! The guy sort of yelled at us: “I can smell it from here. It’s a skunk. You dumb girls!” Well, he didn’t say the last part but he might as well have said it. So they didn’t even check it out. Or shall I say, we didn’t even get to check them out? No, I shall not say that. So we re-entered our skunksmell house. The night didn’t end there – the skunk incident was closely followed by a burglar incident. We heard creeping footsteps upstairs where our landlords live, and our landlords were in Palm Springs. We were so worked up at that point, convinced that somehow, by skunk, by gas, or by burglar, we were all going to die that night. We almost called 9-1-1 again. Luckily, I had the good sense to go outside and look through the upstairs window – it was just Eugenie. You know, the roommate who got married. False alarm number 2. So we are left with two near-exciting experiences. And good blogging material. Really, there’s more real exciting experiences happening in Saskatoon. Real live emergencies, not pretend ones. Just ask my sister, who has shingles, or my brother, who got punched and kicked by masked hoodlums. Wait a minute, one thing did happen. I learned how to make a list on my blog of links to other people’s blogs. And a site meter. (Thanks, Bryanna). So check em out. 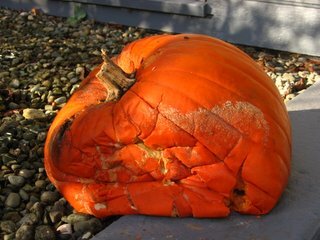 I leave you with a beautiful picture of what happens when your landlords go to Palm Springs right after Halloween and none of the roommates want to take responsibility for disposing of their pumpkin. Enjoy!